Whiting Award Winners Represent 'The Future Of Literature.' See The Full List The novelists, poets and playwrights won Wednesday partly for their work so far, but also for the promise they've shown. If previous winners are an indication, it's a promise they're likely to keep. 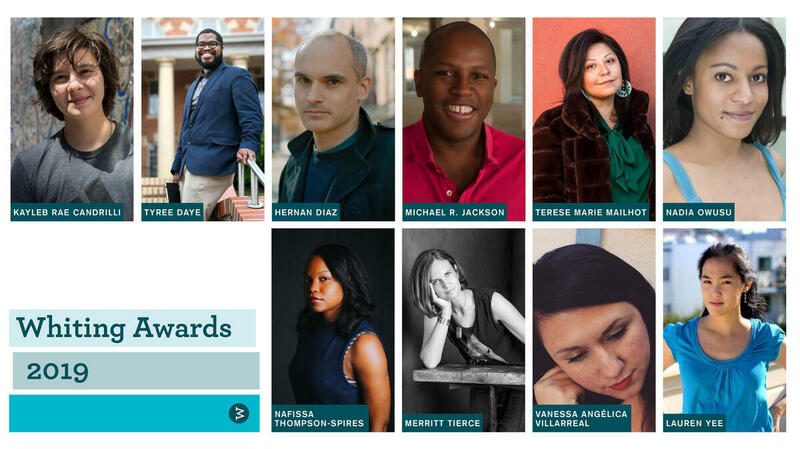 The 2019 Whiting Award recipients (clockwise from top left): poet Kayleb Rae Candrilli, poet Tyree Daye, novelist Hernan Diaz, playwright Michael R. Jackson, fiction writer Terese Marie Mailhot, nonfiction writer Nadia Owusu, playwright Lauren Yee, poet Vanessa Angelica Villarreal, novelist Merrit Tierce and fiction writer Nafissa Thompson-Spires.